Soy chunks are called “Soya Meat” in Sri Lanka. These soy chunks come in different sizes and color. Some are darker and others are lighter in color. 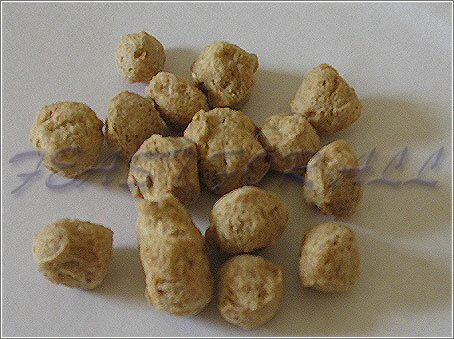 Size also varies form small bead size to big as a marble size. For the frying, the bigger soy chunks should be used. I used the biggest one available in Sri Lankan stores. The soy chunks should be soaked in hot water for about 10 minutes. If its longer than that, when fried they will be soft and chewy. But if its not soaked or soaked only for a few minutes, they will be quite crispy and hard. Soy chunks are high in protein and can be used in many dishes. The most common dish cooked in Sri Lanka is the soy meat curry. They can also be mixed in pulavs. Is it possible to get some samples of soy meat of the size of a thumb? Yes, there are different sizes available from the size of a thumb to very small bead like pieces. But the important thing is, when you soak the dried chunks in hot water, they absorb the water and become quite big.